Well that was certainly an interesting weekend of action. We hope whoever made road trips over Saturday and Sunday enjoyed the games despite the results. Our Senior Camogie panel were thought a hard lesson by Kilkenny in the second half of their opening Littlewoods National League game. Although they lead at the break, the experience of the League Champions shone through and Kilkenny won comfortably. The Senior hurlers got their league journey off to a winning start with victory over Carlow in Parnell Park. Darragh O’Connell, Eamonn Dillon and Donal Burke all shot goals to aid Mattie Kenny’s side to the perfect start. Let’s hope there’s more of that this weekend. And Dublin’s Senior Footballers fell to Monaghan for the second time in the League competition. Despite Niall Scully’s first half goal, the home side got the upper hand and saw the game out thanks to goals from Stephen O’Hanlon and Shane Carey. But what’s in store this weekend? Mick Bohan’s Senior Ladies Football side finally get up and running this weekend in the defence of their much coveted National League crown. And they’ll be the curtain raisers in Croke Park ahead of Jim Gavin Senior Footballers Round 2 League clash. 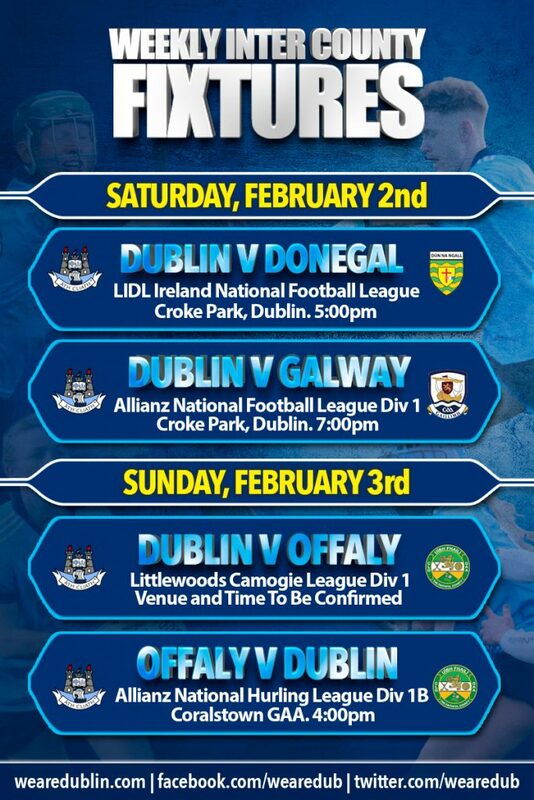 Donegal are Dublin’s opponents in the first of seven round games. Dublin will use Croke Park as their home ground both this Saturday and on February 23rd when they face Mayo. Their other home games will be against Westmeath and Monaghan, while they’ll take to the road to face Tipperary, Galway and Cork. The dust has hardly settled on yesterday’s opening Football League defeat to Monaghan in Clones, but Jim Gavin and his panel must brush themselves off and prepare for their Round 2 encounter with Galway. And these two sides will be no strangers to each other having met three times in 2018. The Tribesmen went unbeaten in the round stages of the League last year, having only been promoted from Division 2 in 2017. They held Dublin to a draw in Round 6, but Dublin went onto to face and beat them in last year’s League Final in Croke Park. They came face to face again in the All Ireland Semi Final, with Dublin again the victor. New Dublin manager Frank Browne won’t dwell too long on last weekend’s result in Kilkenny, and will take the hard lessons into training this week. And Offaly will be looking for their first win in the competition. 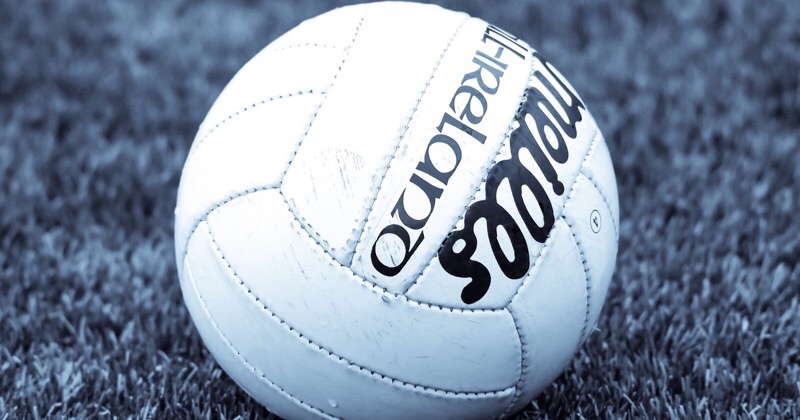 On Saturday, the were defeated by Clare in Whitegate, and the week previous fell to Limerick at home in St. Rynagh’s. Dublin showed signs of dominance in the first half on Saturday against Kilkenny and it will be that period of the game they’ll need to capitalise on this weekend. And they can do it. But they’ll want these vital points before heading into a two week break ahead of their tie with Limerick on the 17th. We’re just waiting on the confirmed venue and throw in time for this Sunday’s game. Stay tuned and we’ll being it to you as soon as we know. Dublin are sharing the top of the Division 1B Hurling table with Waterford and Galway, just sitting below these two on score difference. They put in a fantastic battling performance against Carlow last Saturday night in front a home crowd in fortress Parnell. Trailing at the break Mattie Kenny made some vital changes that swung the game back in their favour as they went on to win on a score of 3-15 to 0-18. This weekend they’ll be hitting the road with no home advantage to rely on. They’ll brave the elements of O’Connor Park as they face Offaly, who started their campaign off with a heavy defeat to Waterford yesterday. So the men from The Faithful County will have points in mind when they welcome the boys in blue. And there you have it. four games over two days. All four codes covered. make sure you stay tuned to www.wearedublin.com for team news and build up to all games this week.